You can use the code on as many blogs or websites as you want. The interface has tabs across the top to switch between sites/stats for easy navigation. The information is incredible. 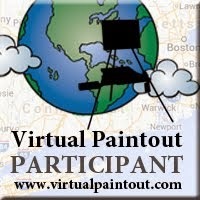 As an example, on the Virtual Paintout blog today I can see the individual pages people enter through, the search words used and the search engines used, the countries visited from (today's are USA, France, UK, New Zealand, India, Canada, Romania, Netherlands, and 7 other countries, respectively). With my live visitors I have right now, I can see location, IP, Browser, Resolution. Along with how many times they have visited and their duration. I could also click the "Chat Now" button and whatever I type would pop up on their screen as long as they are on my site, and it doesn't matter what browser they are using. I think it might freak me out if it happened to me, but I can see how it would be useful in a sales situation to let them know you are there if they have any questions. Maybe. I can also see that the top cities today are Vancouver, Stevens Point, New York and 141 other cities. These are only a few of the stats available. Check it out. Blows most others away. Not sure if this one is finished or not. I'll look at it a day or so and see if I can figure it out. Pardon the poor photograph, it's large and difficult to shoot well.